Oily hair is a common problem faced by a number of people. The secretion of sebum glands causes your hair to get oily. 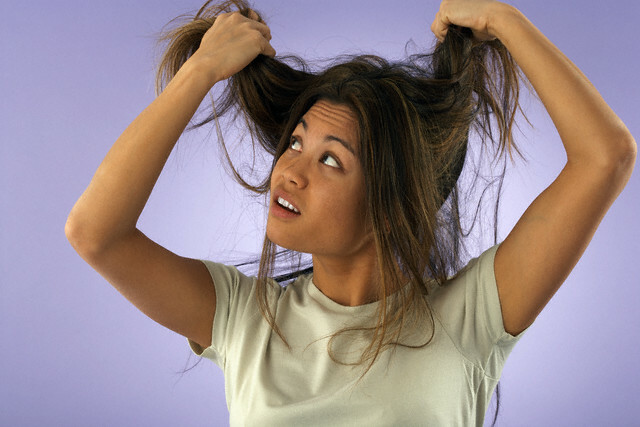 Even though oil is needed to keep your hair healthy and shiny, too much oil can cause dandruff and itching. The excess oils in your scalp needs to be removed. Here are a number of home remedies to help you keep your scalp clean. Aloe Vera gel offers the best remedy for all kinds of problems. Add some Aloe Vera gel to your shampoo to treat oily hair. Take a cup of mild shampoo and add a tablespoon of lemon juice and a teaspoon of Aloe Vera gel. Mix the ingredients well. Use this to shampoo your hair. Let it stay on your hair for a while to act up on it. Wash off well to ensure no residue is left behind. The remaining shampoo can be stored for about a week. Use it daily to shampoo your hair. Alcohol solves all your hair problems instantly. Most people prefer to use vodka to treat oily hair. Mix a glass of vodka in two glasses of water. Use this solution to rinse your hair. Let it stay for a few minutes and wash off. It makes our dry immediately. This solution can also be used as a spray to remove excess oils. Apple cider vinegar has really good effects on your hair. It must be used only after diluting in water. Take two or three tablespoons of apple cider vinegar or white vinegar. Add it to a mug of water and make a solution. Use this solution to rinse your hair. Let it stay for some time, and then wash off. Use this treatment thrice in a week to treat oily hair. For people with oily hair, it is better to avoid using hair styling products. Never use shampoos containing conditioners. You can try using styling products at the hair ends if absolutely necessary, but never near your scalp. Using bath soap on your hair once in a while can help remove excess oils. Apply some soap on your hair during your bath. Use the soap on your scalp and lather well. Let it stay for 2 minutes before washing off. Using bath soap once a week helps remove oils, but it is not very good for your hair. It can harm your hair if used for long. Egg yolk is a good conditioner and removes excess oil from your hair. Beat 2 egg yolks and add some drops of lemon juice to it. Mix well to get a mixture and apply on wet hair. Let it stay for 5 minutes before washing off. Ensure no residue is left behind. Honey is very effective for treating oily hair. Mix 2 teaspoons of honey and an egg yolk. Leave it to dissolve for half an hour. Use this mixture to apply all over your hair and massage well. Use a mild shampoo to wash your hair properly. Try this treatment twice a week. This is a very common remedy for oily hair. Extract some lemon juice and add to a cup of water. Mix 3 teaspoons of honey and let the mixture dissolve well. Apply this on your hair. Let it stay for about three or four minutes and then wash off using a good shampoo. Try this remedy three times a week for best results. The tannic acid in tea helps in keeping your hair dry. Take some tea leaves or tea powder, and boil them in a glass of water. When the solution becomes lukewarm, take it and apply on your hair. Let it stay for about 3 to 5 minutes. Use shampoo and water to wash your hair well and remove the oils. In case you are in a hurry, using talc is the best option to offer instant remedy for oily hair. Apply talc on your scalp to absorb the oils. It saves your hair from looking oily. Corn starch can also be used instead of talc. Remember to wash your hair as soon as you return home. Baby powder can also be used on your scalp. Take some baby powder and sprinkle on your scalp. After letting it rest for 5 minutes, comb your hair. All the excess oils get soaked by the powder. The best way to treat the excess f oils in your hair is to use your shampoo on a daily basis. Keep your hair clean and oil free by shampooing to give it a beautiful and lustrous look. Each time you shampoo, make sure you rinse your hair well. This ensures that no residue is left behind. Otherwise, your hair will be prone to attracting dirt and oil. When you select a shampoo, choose one which is specially designed for oily hair normal shampoos have a pH level between 4.5 and 6.7. The pH level required for oily hair is more than this range. So, choose wisely. Witch hazel oil helps get rid of oil from your hair. Take a bottle of witch hazel oil and take 4 drops of it. Add 2 tablespoons of water to it and dab a cotton ball in the solution. Apply the mixture on your scalp with the cotton ball. Using this remedy daily or some 3 or 4 times a week helps prevent oiliness of hair. All these remedies are sure shot ways to help get rid of oily hair. Choose your favorite and start following it to keep your hair clean and oil-free. There have various causes of hair loss, One of the main cause is oily hair problem. Oily hair people frequently loss their hair. I also faced this problem. The cause of my hair loss was oily hair, excessive use of shampoo. For the oily hair problem dust gathered in my hair. When I heckled my hair a large amount of hair would be lost.